She hid under lush leaves of summer hoping to be lost to the gatherer’s touch. Deep inside she watched as gentle fingers lifted pieces to be housed in safety over winter’s time. And snow came. Cold endured by only the strongest. Rain to quench when dry days lingered too long. Finally, she let herself be noticed as sun grew long and earth made way for new growth. Her journey complete, a jubilant wink greeted her summer friend. 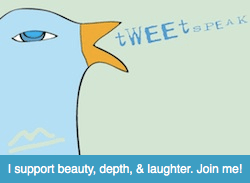 Today is a preview, an Early-Bird Prompt for NaPoWriMo, National Poetry Writing Month. This month following Peace Poetry Postcard Month only saw two pieces of writing from my nimble little fingers. Both of these came from work with my writer’s group. Thank goodness for this wonderful group or there would have been nothing. To get ready for National Poetry Writing Month AND Global Poetry Writing Month, I am offering a last piece of narrative for a while. You might read about Peter a few weeks ago. And maybe you read Shards. I have no character name for her as of yet, but the list is growing. Today you meet Yanna. Three days of hard freeze crept through the grass making it crisp emerald spikes standing like a tiny but eternal forest. It was a good thing Yanna was smallish. Yanna called herself “smallish.” Being small wasn’t a misfortune when one could walk through a crisp emerald forest without notice. Yes. She was smallish. She found comfort in not being noticed. Yanna could slip through and around without an eyelash blinking at her passing. She could stand in a corner and watch those silly big ones thrash about in the misery of their large lives. She could place a piece of bread where it was needed. Then she would melt into the blooms without notice when spring was full. This was Yanna’s gift. She really was just smallish. She wasn’t a faerie or sprite. She was a regular woman. She was no smaller than a petite dancer en pointe, but no one ever noticed her. Her misfortune would come when she needed to be big, foaming, sunburned from the flame of passion. Today Yanna was idle in the frost. She rested the pads of her fingers on the green icy spikes. Little by little adding more pressure pushing down, waiting for a breaking point. Her’s. Not the grass. “Please, don’t do that.” A voice from behind startled her. She stopped but didn’t turn around. She pushed her hand down once more, but ever so faintly. So she stopped. Yanna wanted to look behind her. It was a deep, mellow voice. Somehow, it seemed peaceful in its request. She felt a presence slowly sitting behind her. He must have been close. She felt a warmth starting to encompass her. Within in seconds the crystallized grass she was kneeling on and the grass under her hand melted back to its early spring vigor. There was a neat circle of deep soft green girlding them. She wished she had a camera. If she did, she would turn quickly, use it, and disappear. Yanna was not only smallish, but she was quick. She wanted a photograph to look at later when she was safely tucked away where he wouldn’t be. Where he couldn’t be because he was big and she had a smallish room in a smallish house with a door hidden under moss and greens and windows only a smallish person could look through and see. Again, his words flowed warming their circle. He was poetry she could not and would not ever remember. He was the proprietor of a shop of words that would bring healing and rest, two things she didn’t realize she needed. Amiably, his words continued to spiral around and around her as ice melted into earth quenching roots, not just outward leaves. Nourishing her heart and soul, not just her body. It was just what the first day of spring yearned for after dry winter days that crumbled and cracked Yanna’s heart. A piece from our Wednesday Writer’s Group. It seemed as though he would never find his place where laborers toil. It didn’t matter. He had a purpose. Just because it didn’t involve what others call “real” work, well, that wouldn’t stop Peter. He had one blue eye, one grey one. He was a glassmaker, but not a good one who could sell in shops and at fairs to make a living. Rather, he made things for a purpose and then gifted them to the ones who were in need. He made the glass goose for her. It was small and delicate. He didn’t know her yet but he knew it must be a goose and hers was the hand to hold it, hers the neck around which it would hang. She would make herself known when the time was in season. Until then, he would eventually find and work with Alex washing windows. It had to be something to do with glass. It always was about the glass. When Peter was young child, maybe six or seven, while walking through a forest having been separated from his family’s picnic, he came across an old beaten-down house. At least that was the voice he heard in his head describing it. It was his father’s voice. His father hated old beaten-down things, maybe because he was. Nonetheless it didn’t stop Peter from investigating the Forest House as he named it. Peter could climb or run like any animal of the forest. Or fly, yes. Even fly he believed if he was given the opportunity. He was able to walk without being heard. It was as if he floated above, barely touching the earth. When he reached the Forest House, the door was unhinged, hanging desperately to one side. Without a thought Peter let out a long sigh of air to make himself as small as possible and squeezed under and between making his way into his Forest House. He thought it would be dark but it was the opposite. The roof was gone. Part of it sprawled across on what was once a floor. And the rest of the roof, well, maybe a wind took it to a place of new purpose. It was as if the forest became the house, or the house was now the forest. Vines and moss and golden streams of light from an opening high above flickered and fell across the cottage. Then it caught his eye, glass. Strangely enough, the glass in the window frames was perfectly fitted. He stepped closer to the rectangles still holding a crystal glance out into the depth of trees and brush. As Peter approached one window, he noticed something more confusing. It was as if the window was melting. It was solid. No holes or gaps that he could see, just a sag. Gently he reached to touch it not wanting to ruin or break it. Peter always had a gentle touch. It would come in handy while working with glass in later years. As he reached to place his delicate slender fingers on the pane, a sharp voice screeched out to him. He made himself pull back instead of falling forward in his start. He stumbled away not wanting to break the glass and landing with a flop on the cool mossy ground. Peter sighed. It was his sister, Anne, and he had been found. She always found him. She with her loud voice and stomping feet would halt whatever journey he undertook. At least for this first day in his Forest House he would comply with her demand. But he wasn’t going to let her stop him. He would return often and for years. That first day he left holding Anne’s hand with the image of melting sagging glass in framed windows of his Forest House etched into his memory. When he got home he asked everyone he knew about the dripping glass. He eventually found out that glass is considered a liquid and over years old glass will move like slow, very slow lava. And that was it. Peter was wedded to the magic of glass. But now he was walking, to where he did not know. To meet Alex with whom he would partner. He would discover that he would be a window washer. Yes. That would be it. When washing windows he could look out as well as in. And there Peter would find the owner of his glass goose.